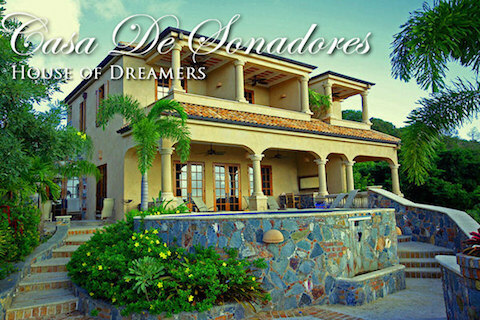 Native stone is just one of the exquisite building materials used among the no expense details of Casa de Sonadores. Welcome to Virgin Grand Estates. Endowed by nature, The Land is comprised of Lush green mountains and Unsurpassed Beauty. Magnificent views of an iridescent sea shimmering on the horizon. Envision yourself owning Real Estate or a Home site in this magical paradise on St. John in the U.S.V.I. Dream no more. You've found Building Lots for Sale in VIRGIN GRAND ESTATES! Originally developed over a decade ago, Virgin Grand Estates, is located directly above Great Cruz Bay and the Westin Beach Resort. The lush tropical landscaping and panoramic hillside views are ideally suited for luxurious vacation homes. 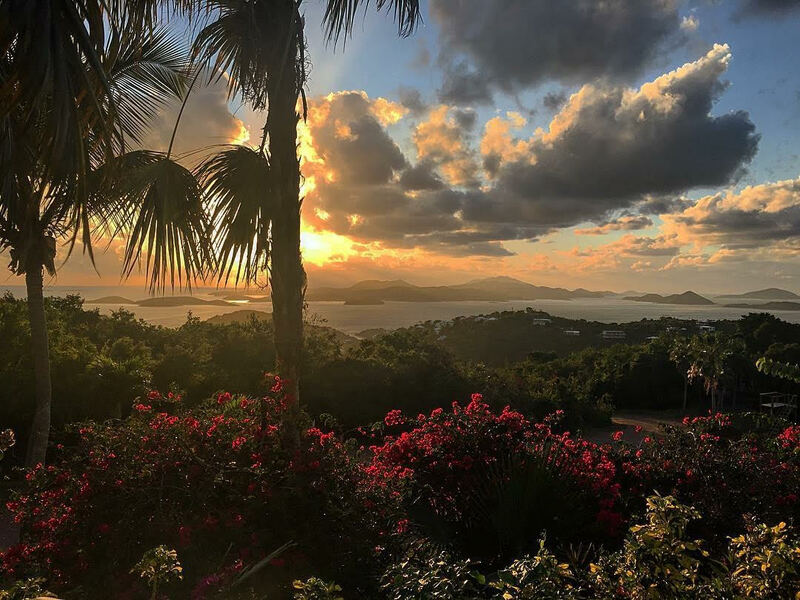 Situated on St. John's exclusive southwest shore, homeowners at Virgin Grand Estates are treated to some of the most spectacular island sunsets on St. John and the Virgin Islands. 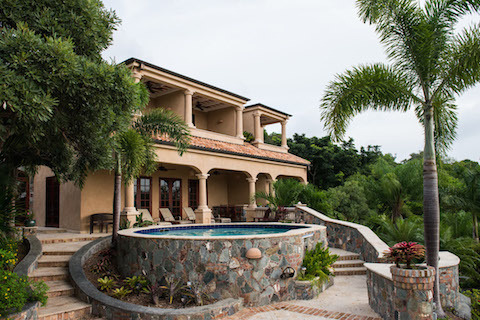 Some of St. John's finest and most attractive villas are located in Virgin Grand Estates. The villas all face south-southwest and are bathed in sunlight. 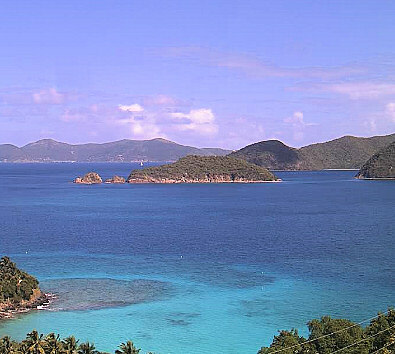 They also have the most spectacular views that span from Little St. James to Lovango and numerous smaller islands. On clear days you can see Vieques and Culebra and even further west to Puerto Rico. The sunset views are St. John's finest with shimmering color and billowing clouds as the sun goes down. Lots in the Virgin Grand Estates average one half acre. How many lots are in Virgin Grand Estates? There are 100 lots in Virgin Grand. 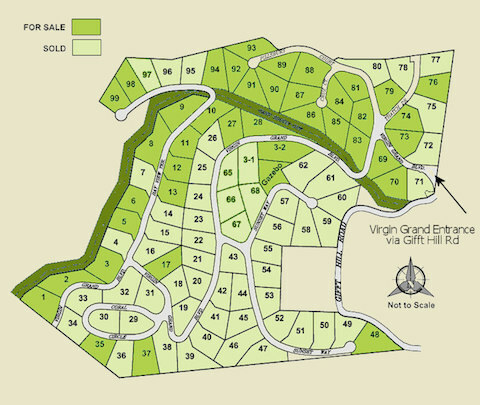 How many lots are already built upon in Virgin Grand Estates? Currently, there are 22 homes either built or under construction in Virgin Grand Estates. What is the slope of the land? Virgin Grand Estates Land generally faces West, offering huge views overlooking Great Cruz Bay and beyond to St. Thomas. There are a few select lots with amazing views towards Ditleff Point. From the high perched vantage of Virgin Grand, the blazing sunsets put on a dazzling show every evening. The sunsets are the most spectacular found anywhere on Earth! Virgin Grand offers many amenities to be appreciated by prospective owners. It is impossible to not notice the picture perfect sunset views the Western facing Land offers. This also keeps sunning decks and pools warm late into the evening. You can walk to the beach and all the facilities of the Westin St. John Resort. A short drive brings you to famed National Park beaches and the shopping and fine restaurants of Cruz Bay. Privacy and security are assured from our gated entrance that only offers "one way in and one way out" access. Virgin Grand boasts an involved Homeowners' Association assuring that the look of development stays true to its island roots. Lush landscaping throughout ensure privacy and "island feel." Reasonable restrictions help ensure consistency without interfering with the creative process of building your dream home. What is the minimum size home that can be situated on our land? Minimum interior size of a home built in Virgin Grand Estates is 1500 sq ft.
Is there a time period I have to begin building after I purchase the lot? No, there is no time period that you have to break ground. Once you break ground, the home should be completed within a reasonable time frame with work being done consistently and continuously until build is complete. What does the land infrastructure contain? Virgin Grand Estates has fully paved faux red brick streets for easy access to every lot. We also have underground utilities to eliminate clutter and offer better utility reliability. Virgin Grand is an electronic gated community. Each guest has a unique access code to restrict entrance to only those authorized to be on the grounds. Does the land have town water available ? As is customary on St. John, each house will incorporate in its design, its own rain gathering facilities and store fresh water in cisterns that feed the home. Gray water is also collected to use for landscaping. What is the average time to build? 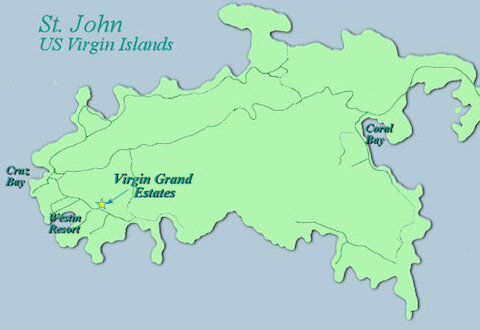 Virgin Grand Estates is located in the Virgin Islands. We have a slow pace of life here and building often takes a year to complete. Our pace will be appreciated after completion and it is the reason so many desire to be here. What is the average cost per square foot to build? Homes built in the Virgin Islands are typically masonry with solid concrete interior and exterior walls. This makes the home practically indestructable and storm safe. Homes typical of type of luxury construction found in Virgin Grand cost $300-$400 per square foot. This figure can vary quite a bit based upon the type of finish materials, type of appliances and other amenities the owner chooses. Many owners list their newly built homes for sale. Historically, many profits have been made for the builder who has invested his time and money on speculative homes on St. John. How easy is it to rent homes/villas and how much income can I expect? Homes built with guests in mind should have expected amenities such as air conditioning, swimming pools, hot tubs and plenty of bathrooms with easy access from swimming pool. If a home has what it takes to be popular on the rental market, 30 to 40 weeks of guest rental can be obtained. Rental income should only be expected to cover taxes, insurance, maintenance and help toward the monthly mortgage payments. Building a home on St. John should not be considered a cash flow generator. The investment aspect of St. John homes is realized through historically high appreciation and demand. On average what do rental companies charge? Management companies take all the day to day headaches off the hands of owners. Management companies, on average, charge the owner 10% of gross rentals. Depending on the amount of work you want them to do, they may also charge fees for bill paying, tax collection and filing, replenishing consumables at the home and landscaping. Of course, they meet and greet guests and handle any calls or special needs the guests request during thier stay. What is this Gazebo lot the Realtors talk about? Ahh, the Gazebo lot! This is a very special place located high in Virgin Grand Estates that affords, maybe the best view on St. John. Years ago, the original developer of Virgin Grand Estates picked the spot that had the best view and cleared the lot and bult a gazebo viewing platform to showcase the development. This lot has never before been offered for sale. If you are a discriminating buyer who demands the best of the best, contact us and we will talk about the unlimited potential of this amazing piece of St. John. We have two spectacular lots for sale in Peter Bay. A gated community located on the exclusive north shore of St. John with a white sand beach and upscale villas. These two lots are located in Upper Peter Bay, high above Peter Bay overlooking the spectacular North Shore Beaches, surrounding waters and views of the BVI's. Lush tropical landscaping and gorgeous views along with paved roads and underground utilities in a well-established community make these lots the most sought after lots on St. John. Named The Boulders. The beautiful lot has a moderate slope and includes plans for a private residence. These plans were developed by Architect Michael Oxman. Michael Oxman has designed a multitude of projects in Peter Bay and is personally known for his unique ability to interface art and architecture in his designs. A lush tropical lot with moderate slope and includes preliminary plans drawn by Architect Michael Oxman. Asking Price for Both Lots $1.7 mil. 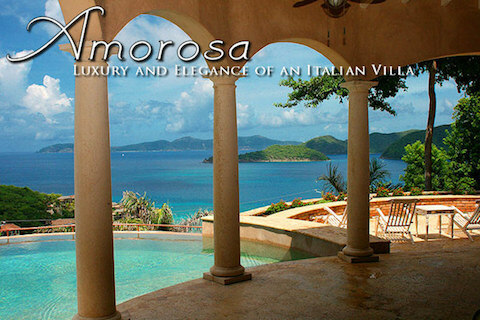 Amorosa Peter Bay is a brilliant Tuscan inspired villa set on the hillside in the midst of National Park lands on St. John's famed North Shore, an area long regarded as home to some of the most highly prized real estate in the Caribbean. Old world elements were meticulously designed and beautifully executed, meshing seamlessly with all the modern conveniences demanded by a contemporary lifestyle. This dramatic site in Upper Peter Bay provides sweeping views overlooking Peter, Cinnamon and Francis Bays, Whistling Cay and out to Jost Van Dyke, as well as a deeded walking path to the white sand beach in lower Peter Bay. Superb location within walking distance to Peter and Cinnamon Bay beaches and minutes from the top rated restaurants of Caneel Bay Resort. Amorosa can also be rented by the week. This spectacular villa is located in the gated community of the Virgin Grand Estates and has four air-conditioned identical master suites with island stone showers and breathtaking views of St. Thomas and 14 other cays. Amenities include a gourmet kitchen with granite counters, state of the art entertainment center, attractive Caribbean furnishings, inviting pool and so much more! This is a one of a kind offering in the best location!!! Casa de Sonadores can also be rented by the week.